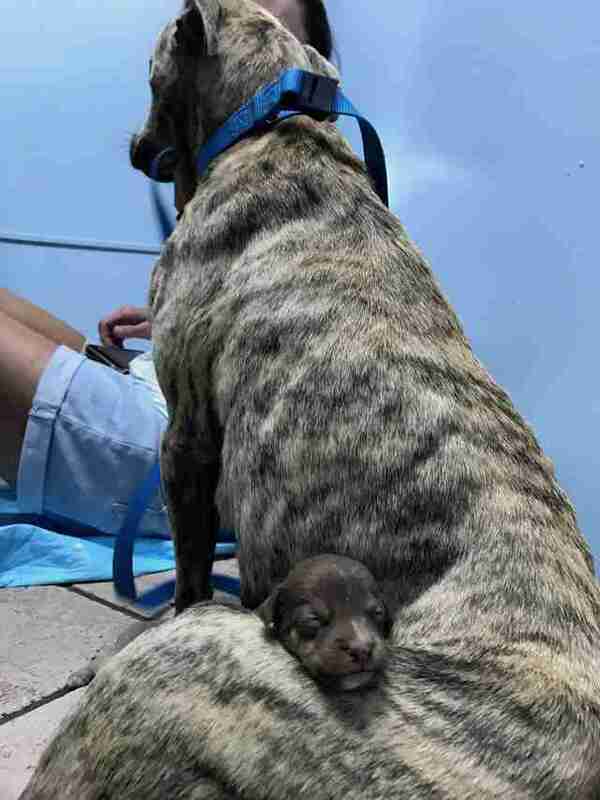 The day Christina Beckles found Reece and her puppies, she was actually looking for another dog — a stray she’d seen wandering around a beach in Puerto Rico. 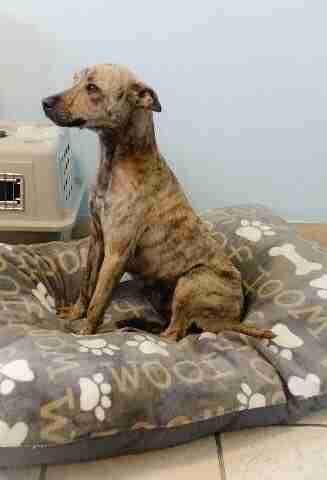 But Beckles did find a skinny, dirty dog with brown, tiger-striped fur — Reece. Beckles also saw that Reece was producing milk, which probably meant she had puppies nearby. 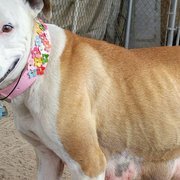 Beckles had her husband and a few others with her, and the first thing they did was feed Reece two bowls of dog food. While Reece filled her empty belly, Beckles spoke to her. 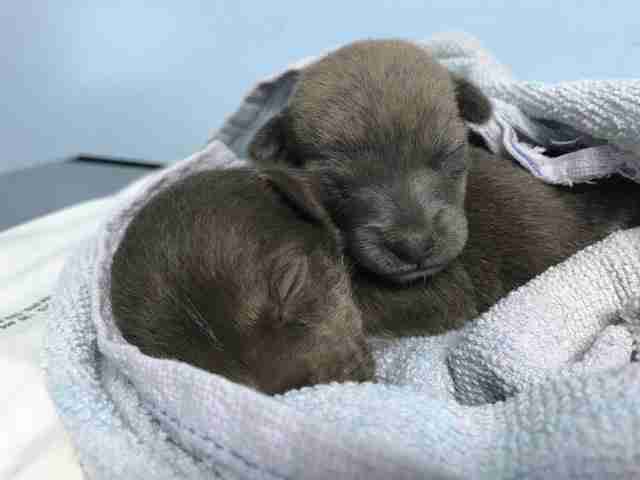 “I said, ‘You’ve got to tell me where your puppies are,’” Beckles said. Perhaps Reece understood because, after she ate, she did exactly that. When Reece stopped in front of a shipping container, Beckles smelled something awful. 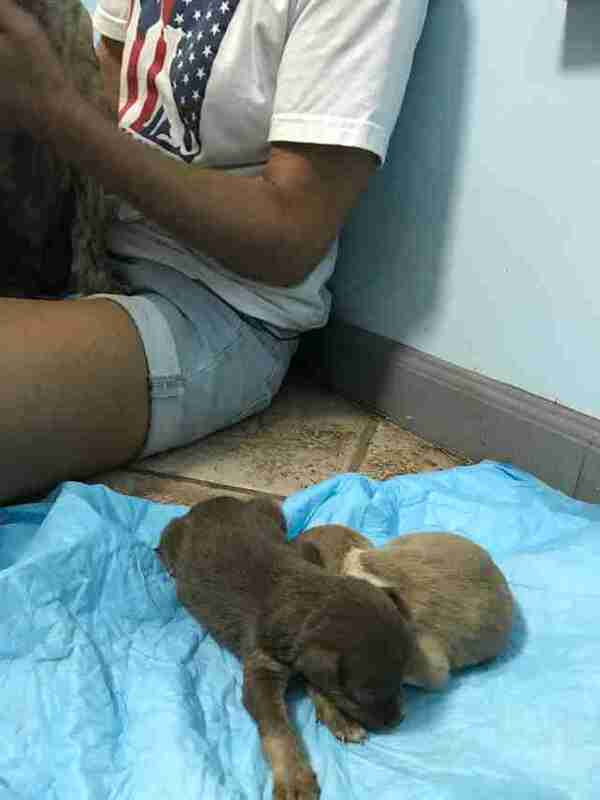 A man in a nearby house came out to see them, and he explained to Beckles that Reece had puppies under the container, which was slightly raised from the ground. The problem was, how was Beckles going to get them out? 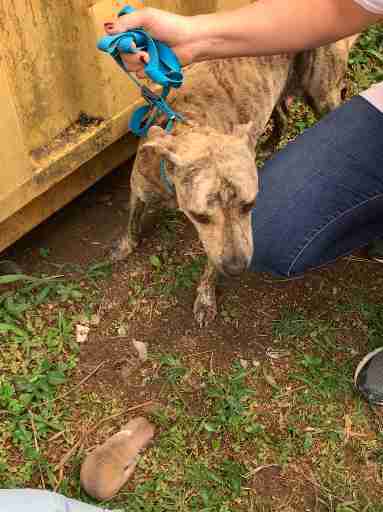 She dropped to the ground to peer beneath the shipping container — and found what she was looking for. 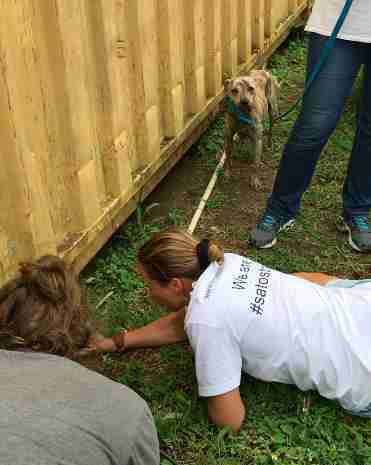 The two live puppies were so far beneath the shipping container that Beckles had to use a PVC pipe to nudge them out. It took about 15 minutes, but Beckles finally managed to push them to safety. “Mom was super happy when they came out,” Beckles said. But Reece and her 2-week-old puppies were all really sick, so the next thing Beckles did was rush them to the vet. 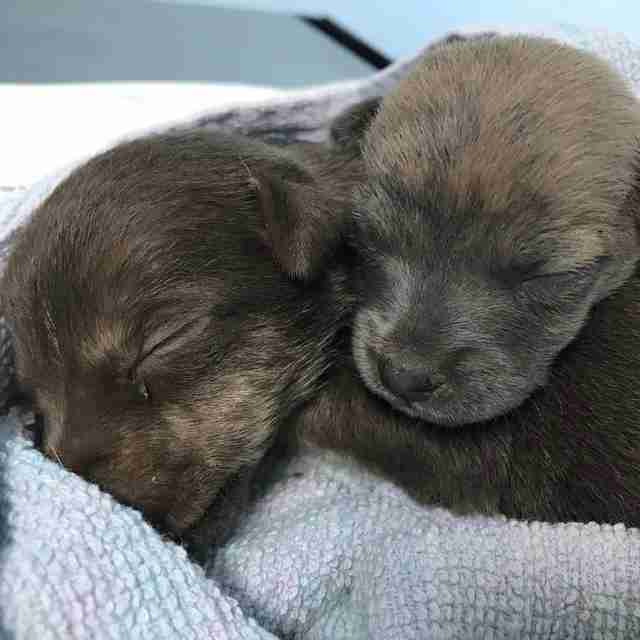 The puppies turned out to be dangerously anemic, and Reece was malnourished and dehydrated, and had a low plasma count, according to Beckles. But with the love and care of the vet staff, Reece and her two puppies are getting better — and in a few months, they’ll be ready to fly to the U.S. and be adopted into loving families. The puppies have been named Parker and Poppy. But not all dogs get such a happy ending. 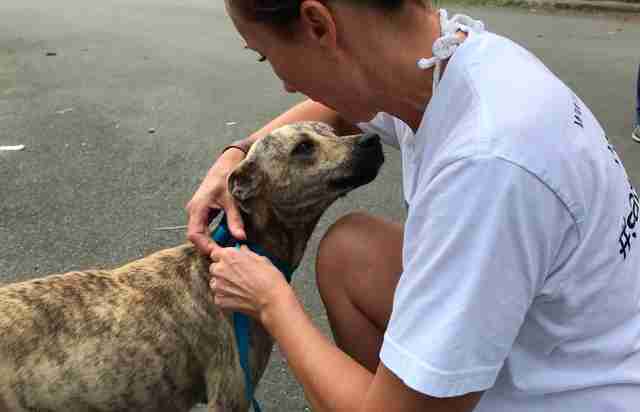 In Puerto Rico, hundreds of thousands of street dogs need help, but there are only about five dog shelters in the entire country, according to Beckles. And if dogs do end up in shelters, it’s more than likely that they’ll be euthanized. 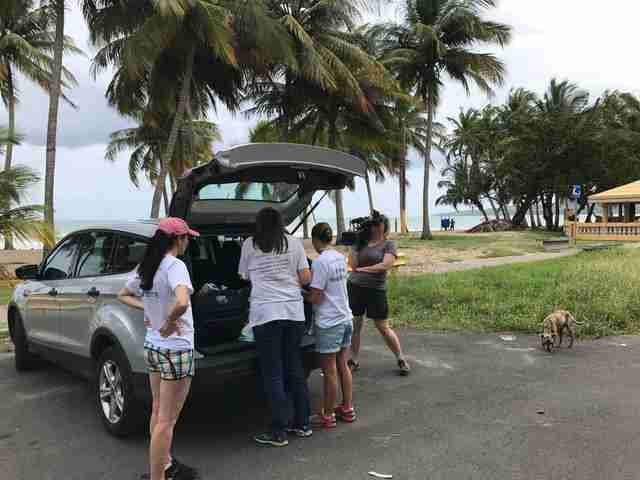 The Sato Project is one of the only organizations helping street dogs in Puerto Rico, and they’ve managed to save about 1,500 dogs in the last 5 years, according to Beckles. 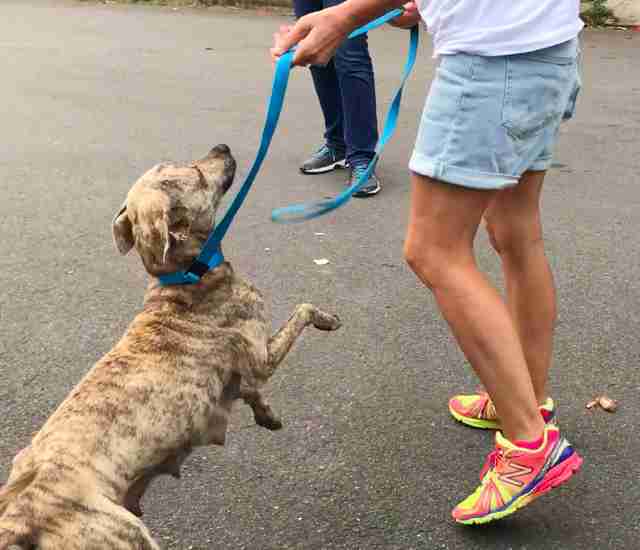 To help Reece, Parker and Poppy get to the U.S., and to save more dogs like them, you can make a donation to The Sato Project.